Pumpkin season is here, and there is no escaping it. There are stacks of pumpkin flavored foods and canned pumpkin in every single grocery story. I don’t mind, however, because I adore all-things pumpkin. My kids love it too, which is why we frequently make these cookies. They are very easy to make with children, and everyone gobbles them up. They even make great snacks for lunch boxes—and if you double the recipe you can pop a batch in the freezer for later. 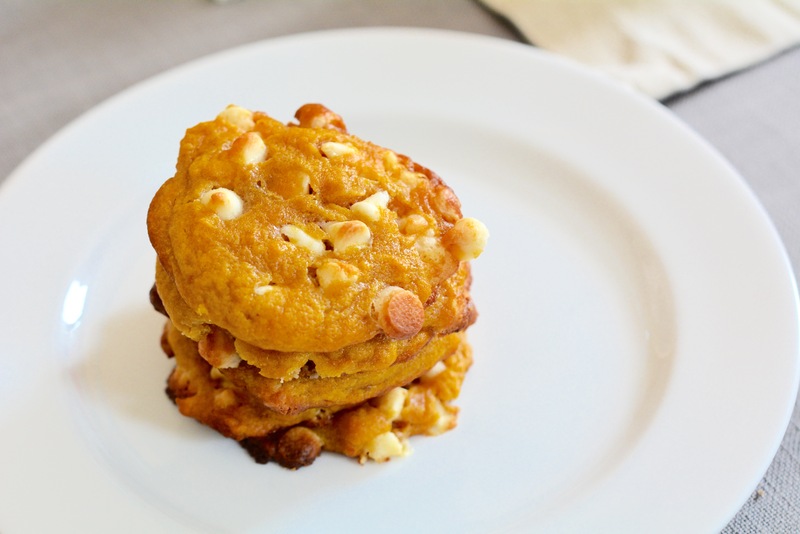 These easy pumpkin white chocolate chip cookies are bound to become an instant family favorite! My family loves these moist cookies so much that I typically make a double batch. Step 1: Preheat the oven to 375 degrees F. Line two baking sheets with parchment paper and set aside. Step 2: In the bowl of an electric stand mixer, add the butter, sugars, and pumpkin. Beat until completely smooth and fluffy. Beat in the eggs and vanilla until smooth. Step 3: In a large bowl whisk the flour, powder, soda, salt, and spices. Turn the mixer on low and beat the dry ingredients into the wet ingredients just until smooth. Use a wooden spoon to stir in the chocolate chips. Step 4: Dollop the cookie dough onto the cookie sheet by the tablespoonful and bake for 8 to 10 minutes, or until set in the middle and golden around the edges. Remove to a cooling rack to cool completely. Store in a sealed container when not enjoying!